This week, I’ve been going to as many art fairs as possible. The organizers don’t make it easy. The fairs are located on the edges of town – in wonderful big spaces, piers, etc. - either way east or way west; the schedules overlap, there are so many of them, and they’re big. I’ve found it takes me a minimum of 2-2.5 hours to walk through a fair. Five fairs – The Independent Art Fair, NADA, Collective Design, Art on Paper, Scope opened on the same day, March 8th, The opening times were staggered, but not by much. distinct approaches - though there’s a lot of overlap. The same artists' work can be found at multiple locations, and the fairs share organizing concepts i.e. you find some mix of installations, single artist booths, the artist stable, anniversary shows, historical overviews, thematic presentations, American only dealers, new dealers, emerging artists/curators, works on paper. That said, if you’re interested in emerging artists, head over to Spring Break. For a mix of emerging and mid-career contempory art, go to NADA, and the Independent Art Fair. For high end 19th-21st Century work, go to ADAA (over now), for high end 20th and 21st C art, go to The Armory Show. And plan. Volta, The Armory Show, NADA and The Independent Art Fair, Collective Design are on the west side of town. Art on Paper is way east, at 299 South Street, ADAA is uptown at the Park Avenue Armory. Spring Break is at 4 Times Square, entrance on 43rd Street. You can purchase food, coffee, drinks at most of the fairs, but that will slow you down. Bon courage. This is an interesting article on the current state of affairs of the antiques market, which has seen prices decline steeply 'for nearly two decades'. Meanwhile, the market for custom made works by contemporary designers and artisans seems to be rising. "Dealers, auctioneers and designers point to a number of reasons for the declining interest in antiques and rapid rise of contemporary design. More homes have open-concept, casual living spaces rather than formal dining rooms and studies, which reduces the need for stately mahogany dining tables, chairs and cabinets." There's also talk about a generational shift, away the tastes of their parents, and from owning lots of objects, and furniture. Predictions are for the pendulum to swing back, but no time soon. The ADAA Art Fair takes place in the Park Avenue Armory - a grand setting. ADAA stands for Art Dealers Association of America. The Art Show was started in 1989, making it the oldest in the country. It features established galleries, and generally, museum quality artworks -19th Century to the present. This fair felt calm, civilized, a good size, not overwhelming . One of the outstanding examples of works on view for the first time from a private collection are the four Harry Bertoia small sculptures at the Jonathan Boos Gallery. With the first gallery you meet – Cheim and Read – there’s a hint of rebellion and joie de vivre. They’re showing Lynda Benglis’s ‘Sparkle Plenty’ – it’s a bright, colorful, sassy installation that greets you with a big, ‘yes’! Though there were several single women artists booths (notably PPOW/Dotty Attie, Marian Goodman/Nairy Baghramian, Lehmann Maupin/Catherine Opie, others), it didn’t feel like a breakout year for women/minorities/others. But, as I said, there’s great works to see. Otto Piene at Sperone Westwater was outstanding, and brought together wall works, paintings, sculptures that I was unfamiliar with, that were beautiful. Similiarly, Mary Heilman’s paintings, ceramics and furniture at 303 was vibrant, fresh, and just felt happy. Nairy Baghamian’s big, funky, pastel bio-morphic forms take over the booth at Marian Goodman. I liked them, but they weren’t as engaging as expected - they’re studied, and ultimately a little cold. Along the way, there were great works to see by Bonnard (Jill Newhouse), Burchfield (Thomas Colville), Avery (Donald Morris), Avedon (Pace), Artschwager (Brooke Alexander), James Castle (Lawrence Markey), Kusama (Barbara Mathes), Nolde (Thomas Colville), Wayne Thiebald (Crown Point Press), and O’Keefe (James Reinish & Associates). I think O’Keefe’s painting, ‘Starlight, Lake George’, 1922, and Frank Walter’s works, and some of the Leesom collages and drawings were my favorites of this fair. Kind of sounds like a WWll drama. So much great artwork on display, mainly during a one week period - why do they schedule things this way?! I’ve counted 10 art fairs in New York City, in March. See the listing below. If you know of additional fairs, let me know. I'm posting this bare bones information for immediate use; to follow, more info. on each fair. Below is a list of the fairs, with the locations, dates and times they’re open to the public. There are usually previews and openings that you can find out about by going to the respective websites. This information is from their websites. I plan to add additional information, including lists of exhibitors, panel and programming info., biting analysis and criticism, etc. soon, but wanted to get this information posted immediately for use. Check back early and often for updates. Disclaimer: This information is accurate to the best of my knowledge. You may wish to double-check it. ADAA – it’s happening now – shake a leg! 125 W. 18th, between 6th/7th Aves. There will be bugs, and I will get better at this, but for the time being, this is my attempt to write about my art world, and what I see happening around me. Anyone interested, and paying attention knows the current art market, and general art landscape are changing dramatically. As a working artist, I have the proverbial worm’s eye view of what’s going on, but in small, large, known and unknown ways, I’m feeling the effects of the shifts. The changes impact what art is seen, prices, the nature of artist relationships to dealers, collectors, and critics. I’m interested in the future present – in current innovations, and those coming soon. I decided to start tracking and writing about some of the transformations, and opportunities I see occurring. We’ve seen the advent of pop-ups, the proliferation of artist-curators; and galleries now trying new models to cope with rising costs, internet sales, mega-galleries etc. -- exciting times we live in. A shout out to Andrew Edlin Gallery, which launched the ‘Et Tu Art Brute’ project, with curator Jamie Sterns. The show opened in November, 2018 in the underground gallery, and due to the enormous response – over 700 artists from 250 cities – the artwork was rotated to accommodate as many artists as possible, through January, 2018. The show addressed the questions: “What defines being an artist today? How does it feel to make art? Who is allowed to participate, and on what terms?” All artworks were under 16”x20” and on sale for $200. Jamie Stern’s next endeavor was ‘Onward’, also an open call for artwork on the theme of ‘VISION FOR THE FUTURE OF WOMEN’, that was shown in a special project booth at the Outsider Art Fair in January, 2018. It was meant to be a celebration of and tribute to the first Women’s March that took place a year earlier. There were over 200 submissions, and all art was 16”x20” or under, for sale for $400. In a matter of months, these initiatives provided the opportunity for over 900 contemporary artists/people who make things to join in participating in an interesting group experiment, and show their work in professional settings. In many of the efforts I’m starting to see, there’s a new regard for artists, a generosity towards them. There’s also a spirited openness and willingness to experiment in presenting art coming from the smaller and medium size galleries re-inventing themselves, and trying to survive. Uptown, there’s also activity. A review of a panel discussion held at ‘Faction Art Projects’ relating to their their inaugural show, ‘All You Have Is Your Soul’, follows below. In February, Faction Art Projects, opened their first show, ‘All You Have Is Your Soul’ curated by Armando Marino and Meyken Barreto, featuring artworks by 17 artists of Cuban descent, in a new 4000’ square foot gallery in Harlem. Faction Art Projects is under the direction of Richard Scarry, Chippy Coates, and Celine Gauld, It’s a response to the changing art market, a way to have a program of exhibitions – there will be five this year - and between shows, free the dealers to participate in art fairs, and other projects. When not occupied by Faction Art Projects, the space, known as Gallery 8, is available for rental to artists and curators who don’t have a presence in New York. Faction Art Projects doesn’t keep a roster of artists, but represents artists showing during the course of their shows. ‘All You Have Is Your Soul’ asks the questions: what is cultural identity, and what shapes it? At its core, the show about what it means to be an artist, and the complexities of artist identity and communities. I recommend seeing it. The title is a good one, and poignant, in view of the nature, often traumatic, of departure, diaspora, and exile experienced by these artists. It establishes a kind of intellectual and emotional sovereignty, and ground zero for those who’ve lost everything; and looks at the directions the artists have taken in their work. 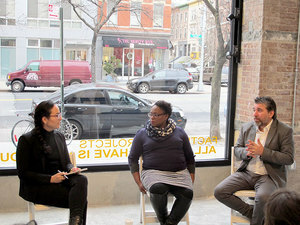 Two of the artists, with very different histories, Juana Valdes, and Geandy Pavon, spoke at a panel discussion on February 17th at the gallery, moderated by journalist and critic Lidia Hernandez-Tapia, and gallery director Richard Scarry. Both artists agreed they want to be viewed as artists first, not Cuban artists. They see their art as American art. Juana Valdes came to the United States at a young age, and grew up in Miami. She described the primacy of visual learning for her, and for many immigrants as non-English speakers. This phenomenon, along with her early experiences with school art projects, and exposure to the progressive art scene in Miami influenced her decision to become an artist (for instance, she was a volunteer on Christo’s ‘Surrounded Islands’, in Miami, 182-83). While working in advertising she made her way to NYC, to Parsons, then the School of Visual Art. Valdes said, ‘a community in exile must recover what they lost’, which is everything. For her, the issue is knowing the past but figuring out how to start again, how to prevent loss form letting you become bigger and stronger. She wants to avoid being exoticized, part of any trends in art, and to avoid nostalgia in her work. She looks at what in her past forged her being, what has strengthened her, and builds on it, and states that a sense of tenacity and questioning are part of her process, and embedded in her art. Her work in the show includes several photographs, a sculpture which relates to the photographic work, along with a ceramic wall mounted work. I liked all of the work, but will limit myself to writing about the ceramic art. Valdes states that she uses her work to address social consciousness, and how identity comes into place, and this piece exemplifies those ideas. Redbone Colored China Rags, 2017 consists of a row of small – approx. 12”HTx7”Dx4”W – draped, folded forms that appear to be made out of cloth but are in fact bone china. Each of the 8 component pieces varies slightly in form and color. They’re affixed to the wall at eye level, at equal intervals. The palette is reminiscent of ‘Synecdoche’ by Byron Kim, and Valdes’ palette is also based on skin tones, evoking different ethnicities. Her work differs greatly from Kim’s in referencing the common immigrant experience of starting out as domestic workers, cleaning, with hand cloths. Bone china was specifically chosen as the purest, whitest of chinas. Geandy Pavon gew up in Cuba, in a family with several painters, and considered art his natural heritage. He attended art academy in Cuba, and both Juana and Geandy remarked on the high quality of art training there. It’s specialized and intense, no liberal arts involved. The use of art as taught at the academies is to transform society, and be part of the revolutionary program. Geandy detailed how everything is owned by the government – there isn’t a system of galleries, or a tradition of private art collecting, and that hasn’t changed over time. The death of Fidel Castro left his brother in power, and censorship, and limited opportunities for artists prevail. Geandy fell out with authorities, and is unable to return and show his work in Cuba. He finds that much Cuban culture thrives in New York, and other locations outside of the Cuba; that Cuban identity has been constructed in exile. Pavon has two paintings on exhibit: Folded House, 30”x40”, Acrylic on Canvas, 2016, and Wrinkled Wing, 30”x40” Acrylic on Canvas, 2016 both in the trompe l’oeil tradition of 17th Century Dutch artists. In particular, he cites Jan Davidsz De Heem as an influence, for his complex conceptual understanding and use of illusion. Geandy stated that he’s not a believer in a picture being more powerful than words – au contraire, he believes words are more eloquent than images. He distrust images, knows you can create illusions and lie visually. A goal of his is to return eloquence and truth to paintings, by ‘torturing’ and seemingly ruining images. His imagery is “distressed”, turned into objects, then finally turned into still lifes. He draws attention to illusion, to deconstruct it, and uses the techniques of photo-realism to force the viewer to see illusions for what they are. His choice of imagery, political institutions like the White House and Capitol clearly comment on current crises. “All You Have Is Your Soul’ approaches issues of cultural identity and definition with sophistication and variety; and without reducing cultural identity to familiar generalities and sameness. At the opening, a friend described this show as ‘nourishing’ – it is! This is a solid show, and a venue to watch.